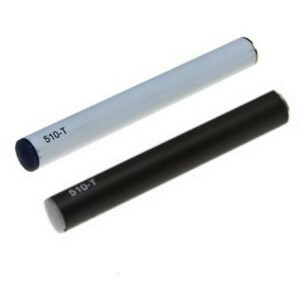 Want a replacement battery for your Aussie Dragon e-cigarette or 510-t kit? This battery works with the 510 and 510-T starter kit, for when you've lost or damaged your old one. Automatic batteries last longer, use less electricity and are more cost effective than using any other battery to recharge your e-cigarette. Available in black or white, to suit the style of your favourite ecig. Automatic batteries have a number of advantages over manual batteries, making them a more popular choice. They provide the closest experience to smoking a traditional one as they are user-friendly with no need to press a switch to activate the device. They also enable people to blend into a crowd as the batteries are hidden within the e-ciggy and so they can easily be mistaken for a regular tobacco one. Automatic batteries also have a lower electricity usage, so users are able to smoke them for a longer period before they need recharging. Automatic batteries do have a couple of disadvantages; if the user is refilling their own cartridges then there can sometimes be an issue with e-liquid leaking onto the battery, which can ruin it. The good news is that this problem rarely happens when prefilled cartridges are used, and some manufacturers are now using sealed batteries to help prevent this. Another issue for some users is that the automatic battery requires them to prime puff the electronic device to heat the atomiser, before inhaling any vapour.